When buying your first car, you may spend hours researching different makes, models, dealerships, even colors of your potential new vehicle. But when shopping for a new car, it is just as important to shop around for a car loan, since you can often find a better interest rate through your local bank or credit union than you would find with dealer financing. Additionally, if you are not financing through the dealer, you may have more negotiating power to lower the amount that your car costs. Read on for our best tips on buying your first car. The first thing you should do is determine how much you want to borrow. You should calculate how much you are willing to spend on a new car based on how much you can afford to pay each month. A good rule of thumb is to spend only what you can easily pay over a three-year period. Naturally, how much you can afford to spend on a new car will determine what type of car you decide to purchase. Be realistic about what you can afford and don't stretch your budget too much. It is important to keep your budget top of mind when buying a car and not get swept away by the excitement, as it will help you avoid some of the mistakes people make when buying a car. Once you've established your budget, you can begin looking for a loan. Many lenders will not guarantee a rate until you sign the papers, but they will give you preapproval for a loan amount and the current rate. You should begin by contacting your bank. If you are eligible for a credit union, you should check there as well. Be sure to ask about automatic payments and lower interest rates. Most banks will lower your payments if you set up an automatic draft. Don't automatically go through your local dealer for financing. First, determine if better rates are available elsewhere. Now that you've established your budget and secured funding, it's time to actually start looking for a car. You can shop at dealerships, but don't be afraid to look in the classifieds and other online sources. You can find some great deals through these sources. However, if you do decide to purchase your car from a private seller, you should always have your car inspected by a mechanic you trust before purchasing it. A good mechanic can tell if the car has been in an accident, been totaled, or if there are any other major problems with the vehicle. This step is absolutely essential if you are buying from a private seller. Remember, if the seller seems reluctant to let you take the car to a mechanic, that's a red flag. Also, be sure to educate yourself on the differences between buying a new and used car. Once you have picked out the car and negotiated the price, you will need to pay for your car. You can contact your bank with the final details. Generally, they will need the title or vehicle identification number to process the loan. Additionally, you will need to give them the title once you obtain it from the car’s previous owner. 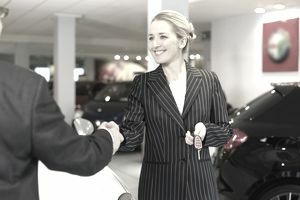 If you are securing financing through the dealer, you can work out all the details at the time of purchase. However, be sure you are getting a good interest rate, not signing up for any hidden fees, and read the fine print. Once you own the car you will need to get a new title and tags (license plates) for your car even though the dealer will give you temporary tags. You can do this at your local DMV office. Most cities have a DMV for driver’s licenses and a different DMV for titles and tags. Another thing to keep in mind: You will not be allowed to register your car until you have found and purchased car insurance. You will need to take the proof of insurance with you to the DMV. Don't automatically purchase a new car. A car is a depreciating asset, which means it decreases in value over time. The biggest amount of depreciation takes place in the first two or three years of a car’s life. You can save a lot of money by buying a two or three-year-old car. Let's say you're shopping for your second car. You can make more money by selling your car yourself instead of trading it in. Selling the car directly will likely make you more money than if you would simply trade it in at the dealer. Do not become upside down on your car. This happens when you roll your previous balance from your trade-in onto your new car loan. This is bad because if you tried to sell your car, you could not pay off the loan with the sale of the car. Additionally, if your car was totaled or stolen, the check from the insurance would not pay off the amount of the loan. Though not always realistic, it's much better to save up and pay for a car with cash. It will free up your income since you will no longer have a monthly payment. Additionally, you will be able to save money on interest. Not sure you actually need a car or trying to save money for one? You may be able to get by with joining a car share for a year or two to save up enough money to buy your own.